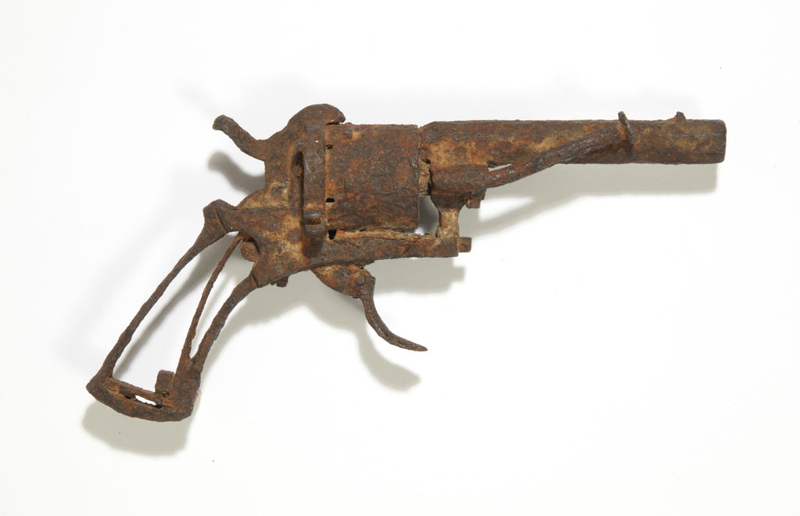 Paris auction house announced it will put up for sale the gun possibly used by Vincent Van Gogh to kill himself. The famous weapon was discovered in the 1960s in Auvers-sur-Oise, north France, where Van Gogh is believed to have shot himself in 1890. In 2016 it was displayed for the first time in the exhibition “On the Verge of Insanity” shown at the Van Gogh Museum in Amsterdam. The small, badly corroded revolver is a small calibre, 7mm pocket revolver of the ‘Lefaucheux à broche’ type, which was found in the fields behind the chateau in Auvers where Van Gogh shot himself. The degree of corrosion suggests that the weapon lay in the ground for 50–60 years; its limited firepower offers a possible explanation for why a bullet fired at such close range nonetheless glanced off a rib, as recorded by Dr Gachet. The bullet was deflected downwards and was lodged too deep to be removed without danger, as a result of which Van Gogh died of his wound some 30 hours later.